The World's Most Famous Beach and The Lotus - Sweet!! As a kid growing up in the fifties, going to Daytona Beach was an annual summer ritual. Dad, mom, my brother and I would head to "The World's Most Famous Beach" for two weeks of fun and sun. Daytona Beach was THE place to go in the fifties and sixties before it became a tourist afterthought. And I have great memories of our times there as a family. I learned to swim there, I saw my first real car race there and I remember buying the best hot dogs, real six ounce cokes and ice cream "nutty buddies" right on the beach. As I grew older, Daytona Beach became party central for spring break. But the coolest thing of all - You could actually drive on the beach!! What more could a kid want? 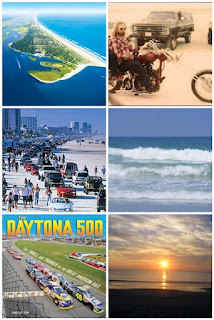 As the MTV generation began to dominate the spring break scene, Daytona became a place to be avoided. The great hotels and motels like the Castaways, the Americana and the Sea Dip became aging relics or disappeared all together. So imagine my surprise, when I stumbled upon a small boutique hotel created from the bones of a 1950's motel in Daytona's more affluent sister beach town, Ormond Beach. This particular getaway was a belated beach trip to celebrate the birthday of my life companion and favorite Nomad, Susie. 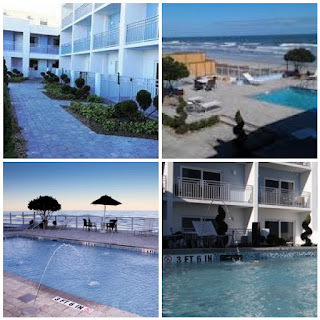 When she said she wanted to go to the beach back in June, I began to search in earnest for a beach hotel close by that we could celebrate, enjoy the beach and stay in a really cool hotel. I have written before, on this blog, about the dearth of quality boutiques in Florida, due to the infestation of ginormous tourist hotels and Disney. Finding small, intimate well designed hotels or upscale B&B's is challenging in The Sunshine State. However, thanks to my diligence and the internet, I found the perfect place for a three day trip to enjoy the greatest beach in the USA. The Lotus Boutique Inn & Suites. Like most old beach towns, Daytona and Ormond have an unending line of mediocre chains and locally owned places that have long since lost their luster. And because the beach is a constant draw for retirees, there are many uninspired high rise condos interspersed between the litany of Days Inns and Beach Blanket Bingo Motels strung along A1A. Uninspiring indeed! This blog is all about the constant search for special places. Places that provide unique environments for travelers to kick back and enjoy the show. The Lotus has made a definitive statement that design matters. At fifty five rooms, it is very small by Florida standards. And kudos to the owner with the vision and his architect with the talent and skill to take the bones of a 1950's motel and turn it into a bona fide modern, cool place to sleep and enjoy the sand, sun and water of Ormond Beach. This small little beachfront inn makes a design statement from the moment you pull up to the concierge's lobby. The lobby is a very successful combination of beach chic and European minimalism. With tile and wood striped floors, colored lighted accents , white walls and white furniture, you know that you have arrived at a place where design is integral to the overall concept of a true Nomad's retreat. As the concierge showed us our room to ensure that it met with our approval, I was immediately impressed by the details that render a space with more than just four walls and a sliding glass door. With sleek black and white furniture set against a bluish grey and white color scheme, simple tile floors and a platform bed, complete with funky sculptural headboard, the designer achieved the perfect space in which to retire after a day at the beach. And the large rain shower, with some of the finest tile work I have ever seen, provides a well designed personal space to ensure that you enjoy your R&R in style. At The Lotus, they didn't stop with the interiors. Our suite on the first floor opened onto a large tiled terrace/patio, providing the perfect spot to enjoy the views of the beach. 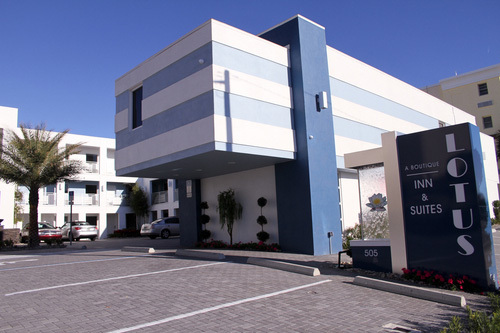 Each terrace has a private gate that allows you to access the beach and the pool just steps away. In addition to your very own personal outdoor space, the designer spared no expense in creating a well designed exterior environment with innovative paving design, subtle level changes, quality landscaping and a sunken fire "fountain" area adjacent to the beach and pool. With the large terrace/patio and the easy access to the pool and the beach, I highly recommend a first floor suite. And if one has a proper terrace, what does one do with it? Simple. This Nomad and his Nomadess decided to eat every meal and spend early mornings watching the sun come up and late afternoons enjoying great wine and conversation with the world's greatest beach at our doorstep. We stopped at a Fresh Market on the way to the hotel and picked up essentials, then ordered take out from two excellent local restaurants - Frappes and Stonewood Grill & Tavern. Since the suite included a well appointed kitchen/prep area with a small fridge, cook top and microwave, we had everything we needed to "eat in". Like the committed Nomads we are, we were able to drop anchor and become serious beach bums for three days. And all of this for a very reasonable $159 a night. So grab your beach stuff and head to Ormond for a stay in a real, honest to goodness boutique hotel on the world's most famous beach. 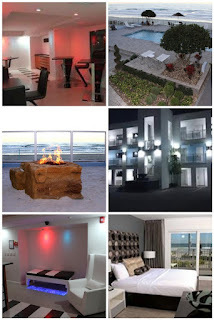 Who knows, maybe a new trend has been started in the small upscale hotel landscape of The Sunshine State, resulting in more cool places for Nomads. The Lotus is a great beginning. Video Artist of The Week - Jazz rock with an attitude comes to us from Steely Dan. Donald Fagan, Walter Becker and a plethora of side players created post modern music before there was postmodern music. And everybody knows that only their albums will do when you want to test a new stereo system.